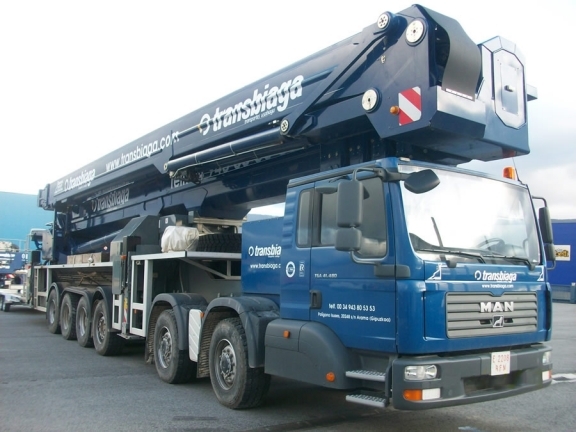 More than 25 years ago, TRANSBIAGA took its first steps with self-propelled mobile cranes, initially to complement its transport activity by including movement and assembly of the elements it transported. TRANSBIAGA has a large and modern fleet of mobile cranes, all by the best makers in the market, handled by an expert team of operators, all duly trained and approved and who go about their activity in numerous countries. Today the fundamental activity at TRANSBIAGA GRÚAS focuses on the wind sector, with the aim of offering clients a safe and complete assembly and hoisting service as follow-up to transport of the wind tower components. To complete this integral service, we have developed a section specialising in the maintenance of wind turbines following their installation. We can therefore offer our clients, technologists, our wind farm assembly and subsequent management services. TRANSBIAGA’s large and varied fleet of mobile cranes means that it can work with different kinds of wind towers and with components by the different technologists. We have units ranging from 100t to 1200 t of load capacity, always fitted with the latest features introduced by their manufacturers, such as the LIEBHERR LTM 11200 narrow track crawler with its telescopic boom of 100m.All of this, with lifting equipment permitting us to attain heights of 70, 90 and more than 100 metres, means that we have the ability to hoist and assemble the entire range of wind towers existing on the market. Note that TRANSBIAGA has the lifting equipment with the world’s highest aerial platform, at 101 metres, made by BRONTO. TRANSBIAGA GRÚAS is an international benchmark in lifting wind farm components, not to mention the complete transport, unloading, lifting, tower assembly, electromechanical assembly and turbine maintenance service that sets TRANSBIAGA apart from any other company in the market. Wind farm assembly: Clúster Navarra, Barasoain, Navarra, España. 15 WTG AW132/3150 TV120m. Nordex-Acciona Windpower. Wind farm assembly: Clúster Mudarra, La Mudarra, Valladolid, España. 42 WTG AW132/3150 TV120m + 1 WTG AW132/3150 TA84m. Nordex-Acciona Windpower. Prtotoype Postensa, La Ventosa, Oaxaca Mexico. 1 WTG G9X Torre Hormigón 100m, Postensa-Gamesa. Wind farm Moulin de Tizon, Moulin de Tizon, Francia. 6 WTG G9X T90m. Siemens-Gamesa.